Of Nauts and Men. Andrew Pixley. Two pages. A Cybernauts vs. Cybermen compare and contrast. What The Butler Saw. Ian Fryer. Four pages. 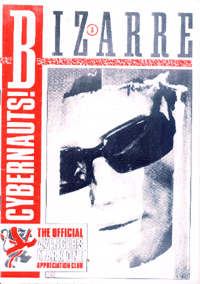 'The Cybernauts' and 'Return Of The Cybernauts' picked over. The Killing Machines. Mike Richardson. Two pages. A look at 'the various mechanical killers' seen in The Avengers. CI5: A Bizarre Supplement: The Men From CI5. Author Unknown. Two pages. Gordon Jackson profiled. Dead Man's Treasure. Michael Richardson. Three pages. The history of The Avengers Treasure Hunt. Cyberminds. Chris Bentley and Ian Fryer. Two pages. The careers of Michael Gough, Frederick Jaeger, Peter Cushing and Robert Lang are looked at. The Cyber Files. Anne Dempsey and Chris Bentley. Three pages. The Cybernauts in print.